I’ve been at BuildASign.com for a year now where I manage a great team of developers and work to grow the culture of quality. Therefore, only a small fraction of my time is spent actually writing code anymore. I found this article by Diana Larsen and James Shore thought provoking: Your Path through Agile Fluency. Such a simple concept. Automated tests and code coverage analysis are not new concepts by any stretch, but there are still enough developers out there not doing it that it still warrants the mention. 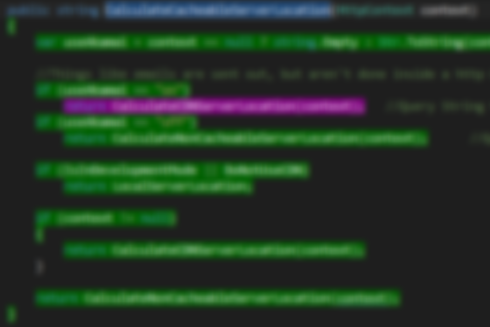 The code is blurred for property protection, but you can clearly see that purple line highlighting no test coverage. I’m not trying to advertise anything here, but I used dotCover and I like it. If you aren’t using inexpensive tools to increase the speed and quality of your development, you should be.